Originally published under the title "Obama's Seductive Gulf Summit." In an effort to quiet their objections to international recognition of Iran's nuclear threshold status, President Obama offered the Gulf Arab states impressive-sounding, but substantively meaningless, new security guarantees. President Obama convened the May 13-14 Camp David summit with the Sunni Arab leaders of the Gulf Cooperation Council (GCC) in pursuit of a grand bargain. If the Gulfies would mute their objections to his coveted nuclear agreement with Iran, he would compensate them with the American security guarantees against Iranian aggression in the region they sought. From Mr. Obama's point of view, the summit was a success, in spite of the snub by Saudi King Salman and the other key Gulf leaders who declined to attend. Putting aside their doubts, the GCC leaders in the end signed a joint statement endorsing "a comprehensive, verifiable [Iran nuclear] deal that fully addresses the regional and international concerns, " saying it would serve "the security interests of GCC member states." At least some of the council leaders thought their side did well at the summit too. GCC Assistant Secretary-General Abdel Aziz Abu Hamad Aluwaisheg told a press conference May 15 that the Camp David summit "exceeded the expectations of most of us" by reassuring GCC states of an "unequivocal" commitment to their security. They were impressed when Mr. Obama described his commitment to their security in expansive language: "First, I am reaffirming our ironclad commitment to the security of our Gulf partners." 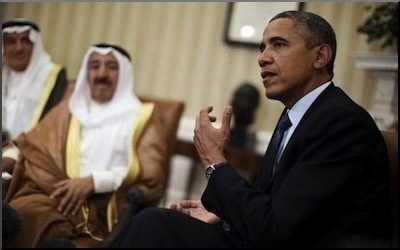 Obama's security guarantee to GCC states is limited to "external" threats "inconsistent with the U.N. Charter." Perhaps they did not look too closely at what the president actually promised, because the specific terms of the commitment he made, in fact, fell far short of the security guarantee the GCC partners were seeking and may have thought they received. The joint communique limits Mr. Obama's security guarantee to "an external threat to any GCC state's territorial integrity that is inconsistent with the U.N. Charter." These carefully chosen words limit the U.S. commitment to a scenario in which the Iranian armed forces invade the sovereign territory of a GCC member. This formulation is actually a retreat from the more inclusive commitment Mr. Obama made two years earlier in his 2013 address to the U.N. General Assembly, in which he pledged to "confront external aggression against our allies and partners." Marching armies across borders is not the typical pattern of Iranian aggression in the region. Marching its armies across borders is not the typical pattern of Iran's aggression in the region, nor is it the main threat worrying Saudi Arabia and its GCC partners. The more common pattern of Iranian aggression against the Sunni Arab heartlands is to foment militancy and extremism among Shia minorities within the Arab states (and among the Shia majority in Bahrain), financing the opposition, and sometimes supplying military training and weapons to oppose the Sunni regimes. It is a model that does not match up neatly with the U.N. Charter, even though it has been a common paradigm for aggression against neighbors worldwide since 1945. As Philip Gordon, who until last month served as senior Middle East director at the National Security Council, observed, there is always "the question of what's an 'external threat.' Nobody can say exactly what it means. That's the problem with it." The Saudis see Iran trying to encircle them with its Quds Force killing Sunni Muslims in Syria, mobilizing Shia Muslim militias in Iraq, providing arms to the Houthi rebels in Yemen or fomenting unrest among Saudi Shia . Fundamentally, the Saudis believe that America's friends and interests are under threat, and the U.S. response has ranged from indifference to accommodation. At the summit, the GCC leaders were pleased by the commitment the president made that the United States and the GCC "will work together to counter Iran's destabilizing activities in the region." And in Yemen in 2015, the president is putting the focus on cooperation with the GCC against Iranian subversion, rather than supporting Houthi grievances in the name of human rights, which might be his normal inclination. It is an open question whether the president will maintain his new posture of solidarity with the GCC. In Bahrain four years earlier, he did the opposite, expressing sympathy for a Shia uprising against the Sunni government that hosts the U.S. Navy's Fifth Fleet even while admitting Iran's role in subversion and arms supply against it, suspending deliveries of weapons to the government of Bahrain, and calling intervention by Saudi Arabia and the United Arab Emirates to defend Bahrain "alarming." After Mr. Obama's Iran agreement is signed and endorsed by the U.N. Security Council, and he no longer needs the Gulf leaders to be quiescent, it is an open question whether the president will maintain his new posture of solidarity with the GCC as in Yemen, or return to the more typical Bahraini example of supporting uprisings even when they are under Iranian patronage. The more lasting words may be something else he said at the summit — that he does not want "to perpetuate any long-term confrontation with Iran," reaffirming his grand illusion that Iran can "play a responsible role in the region" if only the Sunni leaders will bring it into a dialogue. Steven J. Rosen is director of the Middle East Forum's Washington Project.